One of gaming's most prolific writers has a (somewhat puzzling) opinion on storytelling. Games strike a delicate balance between story and action. The more freedom the player has to interact with the world, the less structure the designers can place on the narrative. Drop the player into a cutscene and you have free reign to tell a tight story, at the cost of completely sacrificing gameplay. Whether or not that trade-off is worth it is up to the designers, but lately many have been leaning towards interactivity - including Metal Gear creator Hideo Kojima. Yes, that Hideo Kojima. The man behind Metal Gear Solid 4, which holds the world record for longest cutscene sequence (clocking in at a whopping 71 straight minutes). The man critically acclaimed for weaving an intricate, generation-spanning saga, one cinematic at a time. It seems the old adage of "do as I say, not as I do" was in full effect as Kojima sat down for an interview as part of the Critical Path Project. "It's very difficult to implement a storyline into an interactive game," Kojima admitted. "I actually think we shouldn't do that. I am not trying to tell a story." 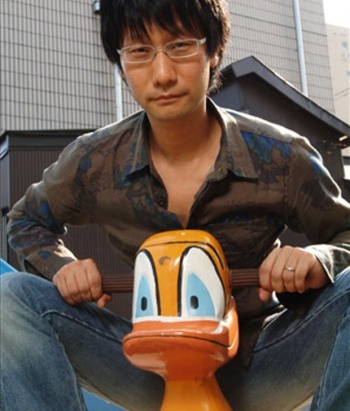 Kojima's philosophy is based on the immersive nature of games and their capability to put the player directly into the action. "You are inside a story, an environment, and acting as a certain character," he said. "And what that character is feeling inside that environment is what I want the players to feel as they play the game. You don't need an elaborate storyline for that." This focus on immersing the player in gameplay doesn't mean that Kojima's twisting narrative is wasted - it's just more of a spice than the main course. "Within that environment I want the players to not only have a fun and exhilarating experience, but also think about many different things. That's my concept." As hard as it is to believe that a series like Metal Gear Solid isn't just an excuse to tell a story, Kojima's ideas do have some merit. The games have always been less about grand political intrigue and more about the experiences of an old soldier caught up in the middle of everything. That's arguably more of a story in its own right, though, so take his advice with a grain of salt.